One of the great things about being a food blogger is belonging to a large, supportive and nurturing community. I have found the food blogging community to be such a great group of people – helping one another through the blogging maze, everyone jumps in to help one another. The community mourns together. And it celebrates exciting life moments just the same. Which is why Amanda and Marla put together an awesome virtual baby shower for Jenny of Picky Palate, who is expecting her third little boy in just a few short weeks. Not surprisingly, the way food bloggers celebrate a virtual baby shower is by sharing some food! We did this last summer when Maria was expecting her first (remember the pavolva I made?) and I’m thrilled to share in Jenny’s excitement today. 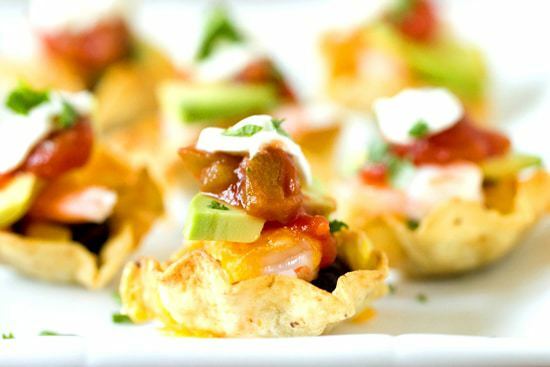 These shrimp nacho bites are my contribution to the shower that is taking place around the blogosphere. I have not attended many baby showers (I think my total hovers somewhere around three), but like any other excuse to get together, there is never a shortage of fabulous food at these events. I’m a big fan of appetizers and desserts. I rarely need to eat a main dish when I go to a party or function; if you feed me enough appetizers and then provide me with something sweet to wash it down with, I’m a happy camper. 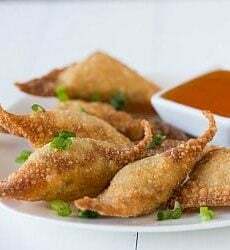 When I was thinking about what I wanted to make for Jenny’s shower, I was leaning towards some sort of fun, bite-size appetizer. 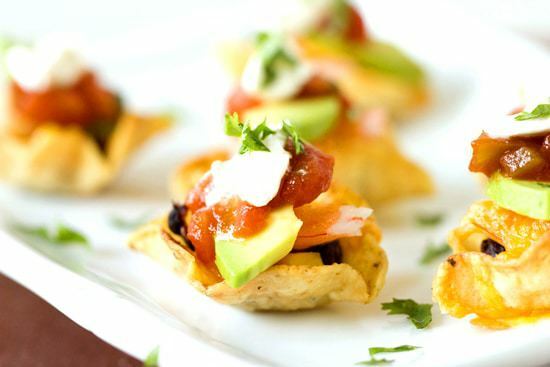 These nacho bites are perfect for any type of party. They are super easy to assemble, very economical, and people can easily eat them standing up or sitting down, and they can use their hands. Any time you can eliminate the need for cutlery at a party it’s a huge win in my book. I had a shrimp and corn quesadilla a couple of years ago during a day trip to Annapolis, MD and the memory of that meal has stayed with me for the longest time. I loved the combination of shrimp with corn, cheese and other traditional Mexican flavors. I used that as the inspiration for these nacho bites – lots of flavor, very colorful, and easily eaten hot or warm. Of course, if you’re not hosting a party, you could just make a big ol’ plate of these nachos, piling everything on – perfect for watching football this fall! Below the recipe is a list of the other blogs participating in the virtual baby shower today; be sure to check them out – there are tons of delicious (and very creative) recipes! 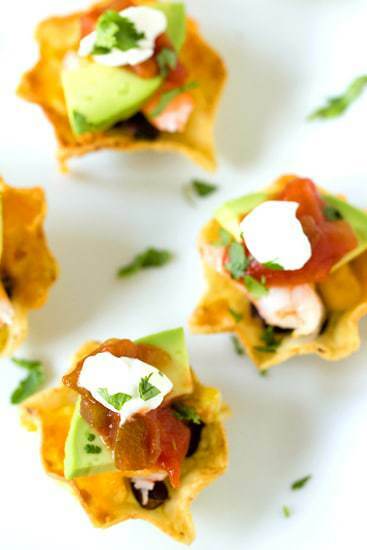 These shrimp nacho bites are perfect party food! Arrange the tortilla chips on a baking stone or oven-safe baking dish. Place a small amount of black beans and corn in the bottom of each scoop (about 5 beans and corn kernels per scoop). 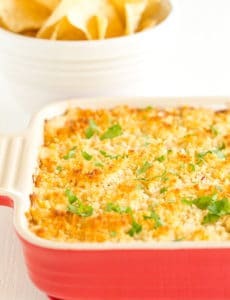 Top with a piece of shrimp and sprinkle with shredded cheese. Turn on your oven's broiler and let it heat up for a few minutes. When it's ready, put the nacho bites in the oven and broil until the cheese is completely melted and the chips start to look toasted, about 5 minutes. Keep a close eye on them so they don't burn under the broiler! Remove from the oven and top with a small slice of avocado, a dollop of salsa, then a dollop of sour cream and a sprinkling of cilantro. If you need to move them to a separate serving platter and they are still hot, use a pair or tongs to gently transfer them. Serve warm. Now these are some tasty looking apps! 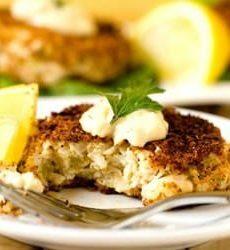 These look so delicious and gourmet and lovely! This is a perfect summer appetizer! Thank u for the recipe! Michelle!! I live in Annapolis! Please, please, please come visit again! I would love to play hostess and take you sailing! these look perfectly delicious!!! especially for any party! These look delicious! 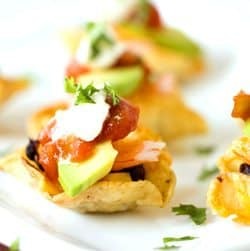 I’m always looking for yummy appetizer ideas! looks like great finger food for a shower :) love shrimp, such a great thing to make bite-size food with. So cute! They look very tasty! These sounds SOOOOOO good!!! I love them!